In a cynical age, poker-faced sincerity is tough to pull off. When it's coupled with innovative filmmaking techniques and visual bombast, the degree of difficulty goes up and up, to the point where you're inclined to give films points for attempting the near-impossible. That's the entertainment netherworld in which the sibling filmmaking team Lana and Andy Wachowski have been trapped, by choice, since the first "Matrix" film arrived on screens 16 years ago, and updated the "Star Wars"-styled space fantasy for the age of virtual reality. The Wachowskis' "Matrix" sequels and "Speed Racer" and "Cloud Atlas" all have defenders, deservedly so. Amid stretches that don't work for one reason or another, you'll find passages of beauty and simplicity and goofy grandeur. And there's something perversely admirable about the Wachowskis' willingness to spend hundreds of millions on popcorn fantasies that are proudly, at times mystifyingly, personal. But even if you adore the idea of the Wachowskis, there comes a point when it would be foolish to deny the disappointing reality. That point has arrived, and the film is called "Jupiter Ascending." It's the story of another "Matrix"-style messiah figure (female this time) fighting for control of the solar system against a "King Lear"-type family of squabbling villainous siblings. The baddies, surviving members of the Abrasax dynasty, keep trying to force Jupiter to sign some kind of intergalactic property deed and harvest her eggs so they can keep siphoning energy from the bodies of imprisoned humans, or something. (I have no idea what was at stake in this film, what the bad guys wanted, what the good guys were trying to do; I'm sure it's possible to figure it out, but I'd rather do something more pleasurable, like untangle wadded-up strands of Christmas tree lights.) Meanwhile, Jupiter's brawny half-man, half-werewolf warrior-protector zips through widescreen panoramas on jet-propelled boots, rescuing her over and over, duking it out with winged demons and sickly humanoid "Keepers" as spaceships crash through asteroid belts and skyscrapers, and explosions rumble and flash, and a symphony brass section topped by a quasi-mystical choir shrieks in your ears. In case you read that last part and thought, "That sounds kind of awesome," rest assured it isn't. "Jupiter" mostly lacks the crackpot inspiration that's been the Wachowskis' stock-in-trade since the late '90s. The cast stars Mila Kunis as the title character, a Russian-American cleaning lady named Jupiter Jones, and Channing Tatum as Jupiter's aforementioned jet-skating bodyguard and wannabe-boyfriend, who's literally a puppy dog cousin of The Terminator (part lycanthrope, he claims) and just as literally a fallen angel (he has scars where wings used to be). The civil-warring siblings at first seem intriguingly campy/ridiculous; the way Balem (Eddie Redmayne), Kalique (Tuppence Middleton) and Titus (Douglas Booth) purr every bitchy line, they might as well swipe the air with kitty-cat claws. But they end up being subsumed by the tediously familiar visuals, sound effects and music (composer Michael Giacchino seems to be recycling cues from the "Star Trek" movies, which weren't too distinctive in the first place). Equally unimpressive is Kunis, who admittedly doesn't have much to work with here (compared to Jupiter, Neo from "The Matrix" is psychologically complex) yet still seems disconnected from the wild emoting around her. Tatum's emotional transparency makes you care about Jupiter's protector, Caine Wise, even though he's as much a stick figure as the other characters. Tatum cries the best righteous manly-man tears in cinema. He's a rare American hunk who can sell Boy Scout decency without seeming like a con artist. But like the other lead actors, he's defeated by the movie's pre-fab cinematic world. Too many of the action scenes, creatures, cityscapes and starships will make you wish you were watching "Guardians of the Galaxy" or "The Fifth Element" instead, even if you didn't like them. At least Redmayne's mannered acting plants a freak flag in the movie's swollen purplish heart. At times his performance seems modeled on how Redmayne imagines Glenn Close might look and sound, should she live to be 100. He trembles and flares his nostrils. He whispers 90% of his lines and shrieks the other ten. Not once does he blink when you expect him to, or for as long. Did Redmayne decide it was necessary to destroy the film in order to save it? If so, give the man an "A" for anarchy. 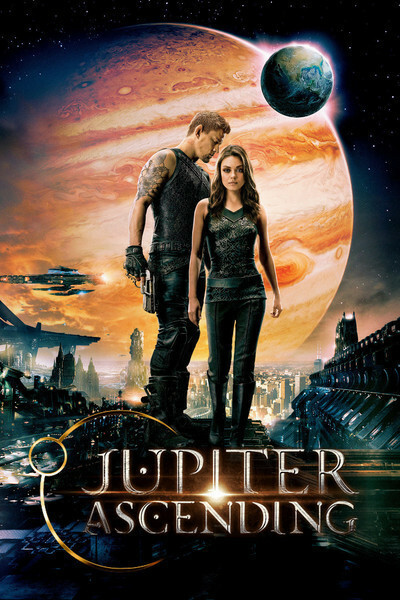 "Jupiter Ascending" is an example of a particularly depressing sort of bad blockbuster: one made by artists that you might not know were artists unless you'd seen their other films. It's not "so bad it's good," which would at least promise a certain lunkheaded obsessiveness. Nor is it aim-for-the-moon-and-land-among-the-stars bad, or any other sub-category of bad that one could make a critical case for. It's blandly, often listlessly bad, check-the-blockbuster-boxes bad, just-out-of-film-school-and-shopping-a-tentpole-screenplay bad. That's the last thing I would have expected from the directors of "Speed Racer," a film whose neon-and-steel-and-peyote aesthetic went beyond incoherence and attained psychedelic poetry, and "Cloud Atlas," a fable about reincarnation, the indestructibility of true love, and the Brotherhood of Man that wanted to be a modern "Intolerance" and got startlingly close at times. Maybe the version that was supposed to hit theaters last summer has more nuanced characters, a more comprehensible plot, and an altogether surer touch. No matter: the two-hour version released to theaters this weekend is striking mainly because long sections of it feel as though they could have been written and directed by anyone with a pile of money to throw around, and a decade's worth of cliched action-fantasies to ape rather than re-imagine. To be clear, the problem isn't that the movie lacks passion or sincerity. This is a defiantly corny silent-movie-with-sound, in which Jupiter keeps falling and falling and falling and Caine keeps soaring in, Superman-style, to scoop her up in his arms. The problem is that the film fails to find a new or even halfway distinctive way to express itself. For all its noise and color, "Jupiter Ascending" looks, sounds and moves too much like every other sci-fi or fantasy adventure you've seen in the aftermath of the "Matrix" and "Lord of the Rings" and "Hobbit" trilogies and "Star Wars" prequels. It's time to reboot the special effects blockbuster before we all die of boredom. The monsters and vehicles and gladiatorial do-gooders duking it out amid overstuffed, busily-photographed CGI landscapes all seem to have been created from one of the same ten or eleven software programs. Even the most lavish movies have an off-the-rack feeling, and "Jupiter Ascending" has it, too. The been-there done-thatness dulls rather than excites the senses. Technically and artistically, this is the first time the Wachowskis seem to be behind the curve rather than surfing the next wave.